CARFAX 1-Owner. 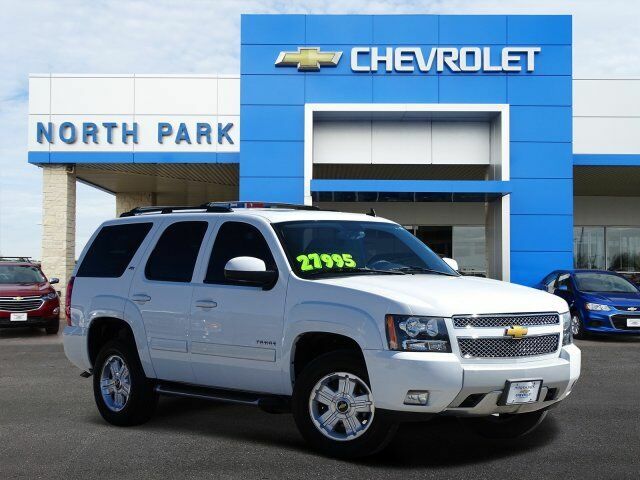 Navigation, Heated Leather Seats, Third Row Seat, DVD Entertainment System, AUDIO SYSTEM WITH NAVIGATION, AM/FM/SIRIUSXM STEREO WITH CD PLAYER, Rear Air, Trailer Hitch, 4x4, ENGINE, VORTEC 5.3L V8 SFI FLEXFUEL READ MORE! SUN, ENTERTAINMENT AND DESTINATIONS PACKAGE includes additional 9 months of SiriusXM Radio and NavTraffic service, (CF5) power sunroof, and (U42) rear seat DVD entertainment system. LT also includes (UYS) audio system with navigation and (DD8) inside rearview auto-dimming mirror. AUDIO SYSTEM WITH NAVIGATION, AM/FM/SIRIUSXM STEREO WITH CD PLAYER 7-inch touch-screen Color Interface Display (CID), 30 gig usable Hard Drive storage space, with navigation and voice recognition, USB port, MP3 playback capability, Radio Data System (RDS), speed-compensated volume, time shift recording capability, SUSPENSION PACKAGE, OFF-ROAD (Includes off-road jounce bumpers, specially-tuned springs and gas-charged monotube shocks, (K47) high-capacity air cleaner, (B71) front and rear wheel flares, (N87) 4 - 18" x 8" aluminum wheels, (RBX) P265/65R18 all terrain, blackwall tires, (NZZ) Skid Plate Package, (BVV) tubular assist steps, (NQH) 2-speed active transfer case with 4WD model and (BPH) Z71 Off-Road Appearance Package, which consists of unique front fascia and bright chrome grille insert. Also includes (V76) front frame-mounted recovery hooks on 2WD models. MP3 Player, Rear Seat Audio Controls, Privacy Glass, Keyless Entry, Steering Wheel Controls, Electronic Stability Control, Adjustable Pedals. SUSPENSION PACKAGE, OFF-ROAD (Includes off-road jounce bumpers, specially-tuned springs and gas-charged monotube shocks, (K47) high-capacity air cleaner, (B71) front and rear wheel flares, (N87) 4 - 18" x 8" aluminum wheels, (RBX) P265/65R18 all terrain, blackwall tires, (NZZ) Skid Plate Package, (BVV) tubular assist steps, (NQH) 2-speed active transfer case with 4WD model and (BPH) Z71 Off-Road Appearance Package, which consists of unique front fascia and bright chrome grille insert. Also includes (V76) front frame-mounted recovery hooks on 2WD models.